Majorika's fairy. 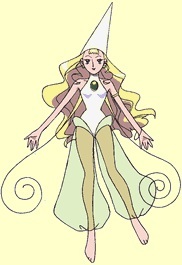 She has a carefree personality and usually agrees with Doremi and the other witch apprentices to tease Majorika. Laralie is her english name. She also turns into a white cat so no one can tell she's a fairy.